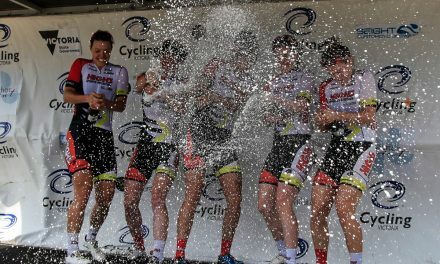 On a hot opening day of the 2017 Battle Recharge, the High5 Dream team lit up the opening two stages to win the Team Time Trial on Stage 1, before putting two riders on the podium in Stage 2. 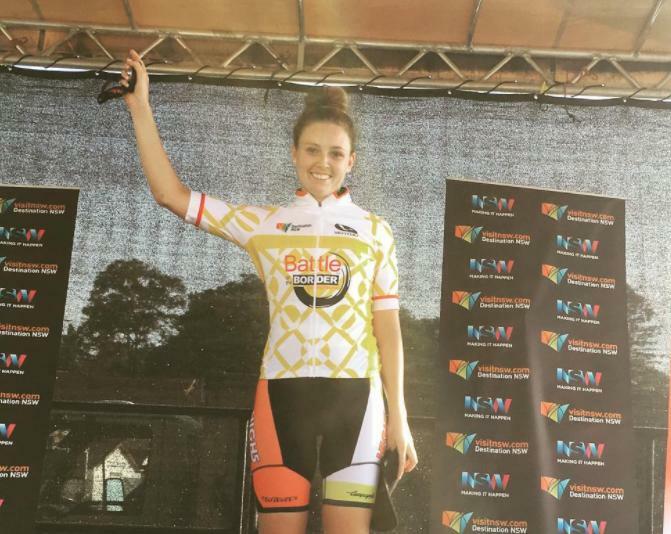 After a dominant display, team captain Em Roper will wear the leader’s jersey going into Stage 3. Powered by two-time Individual Pursuit world champion Rebecca Wiasak, the High5 Dream Team went into the Stage 1 Team Time Trial as the red-hot favourites, and certainly didn’t disappoint, tearing up the Murwillumbah course in 34:01.4 to take the stage win, nearly 90 seconds faster than second-place finishers Specialized Women’s Racing. 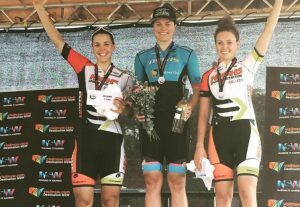 ‘It was great to continue the momentum from Amy’s Otway Tour and start Battle Recharge in the best possible way with a team win in the TTT. It’s a fantastic feeling to share the podium with all your teammates and I’m really proud of how our team rode. We were pretty determined to put in a fast time but as it was our first time riding a TTT there’s always an element of the unknown. We kept the team together and finished with four riders after Kristina unfortunately took a wrong turn into the finish straight. This set us up well with so many options for the rest of the Tour. ‘It was great to see Em follow the winning move in the Crit this afternoon and get a free ride to the finish line. I happily passed the leaders jersey to her. 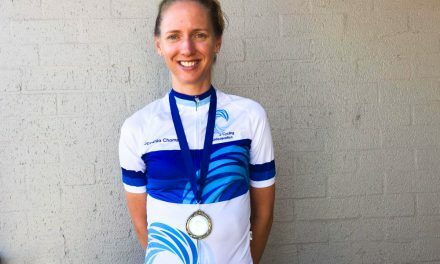 She’s a really hard-working cyclist and a great leader in the team. Em has been working full-time as a nurse this year so has had a reduced race program but is just as strong as ever. Her experience is a huge asset to our team and we’re looking forward to defending the jersey tomorrow,’ said Wiasak. 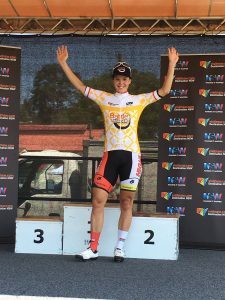 In the afternoon Stage 2 criterium, it was Em Roper who broke away early with Ashlee Ankudinoff of NSWIS Sydney Uni. The duo built up a big lead while Wiasak and the High5 Dream Team controlled the tempo at the front of the peloton. At the finish, it was Ankudinoff who narrowly outsprinted Roper, while Wiasak came home to finish third. ‘The High5 Dream Team had a good day today, we all rode a really strong TTT coming out on top. A win in the TTT gave our team many options leading into the crit. Our plan was to cover moves and keep the race controlled, leading Beck out in the final sprint. ‘I covered an attack from Ashlee and being up on GC meant that I could sit and wait. 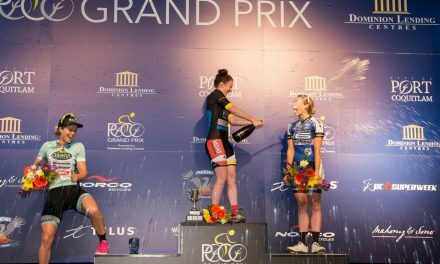 I left my sprint a little too late, however, I am now happy to share the leader’s jersey around with my teammates and now lead GC heading into the road race tomorrow,’ said Roper. 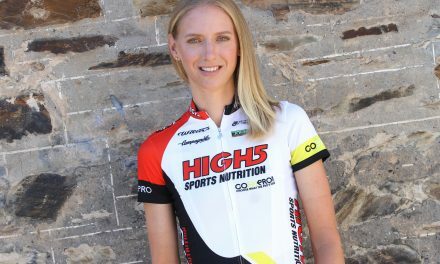 Going into the Stage 3 road race it will be Em Roper wearing the leader’s jersey, as the High5 Dream Team hold the top four positions on General Classification, and also have Jess Pratt leading the Young Rider Classification.